This weekend, The Work Mag is giving you the chance to get in touch with your inner child; that super care free sun baby just yearning to make an appearance. We’re throwing a rad water fight-meets-pool-party this Saturday August 10th from 1pm- 7pm at the Standard Hotel Downtown. 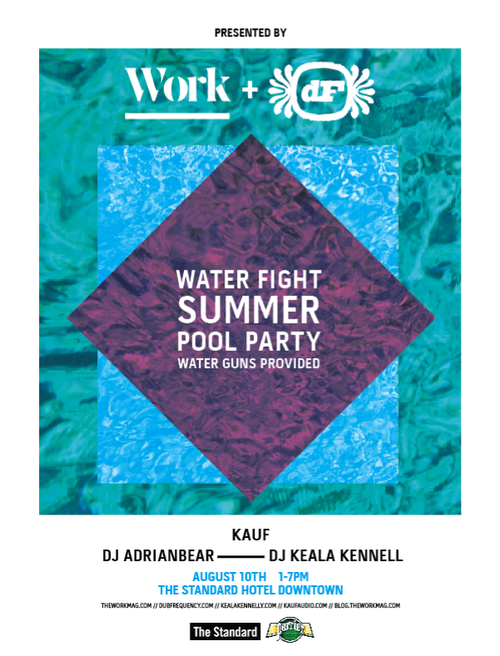 We’ve got DJ Adrian Bear, DJ Keala Kennelly and Kauf behind the decks to bring you some sweet summer sounds. So come hang out, bring your friends, and enjoy LA’s best asset: fun in the sun. And don’t forget, The Work Mag now has a KICKSTARTER to help us bring you Issue No. 6 ad free. Show us your support!